When one is planning to be in a city known as the Culinary Capital of South America, what does one do? Plan as many eating-related activities as possible, of course! 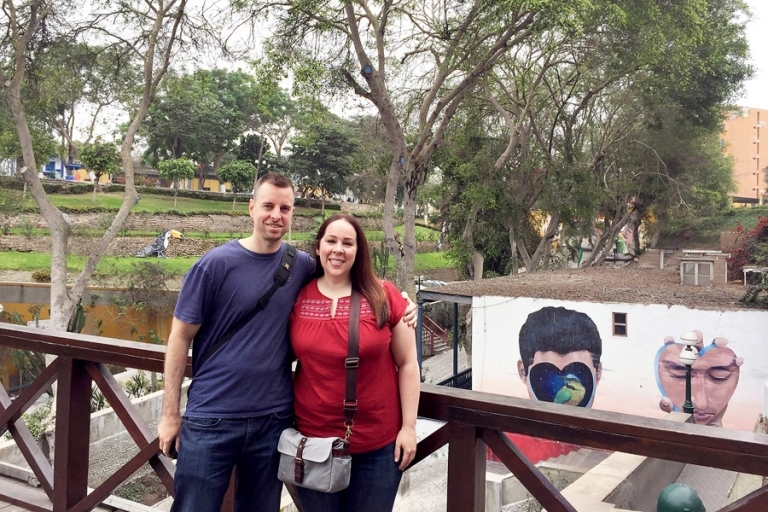 Chris and I stayed in Lima, Peru for a full day on each end of our Lares Adventure trek and we were excited to try the cuisine on a new continent since it was our first time in South America. We stepped off the plane Saturday night with a list of must-try foods and we even had reservations for a food tour with The Lima Gourmet Company first thing Sunday morning. 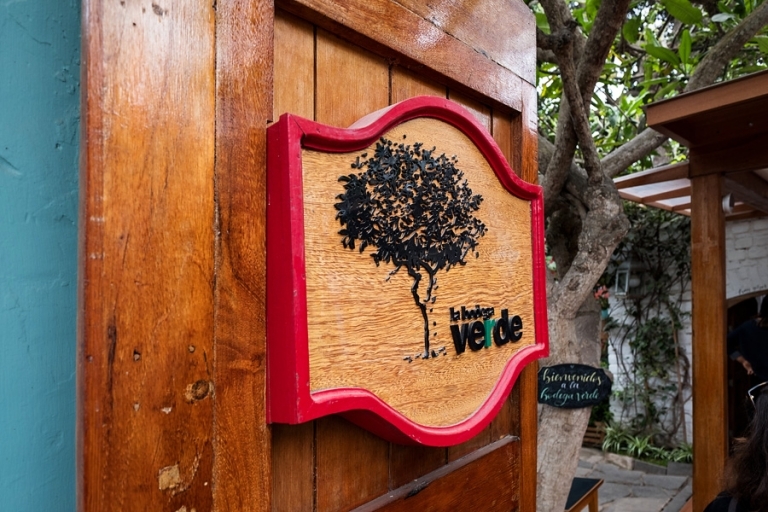 The food tour kicked off our time in Peru with the perfect introduction to the city by combining an overview of several neighborhoods, visits to delicious restaurants, a tour of a local market, and even lunch alongside ancient ruins. 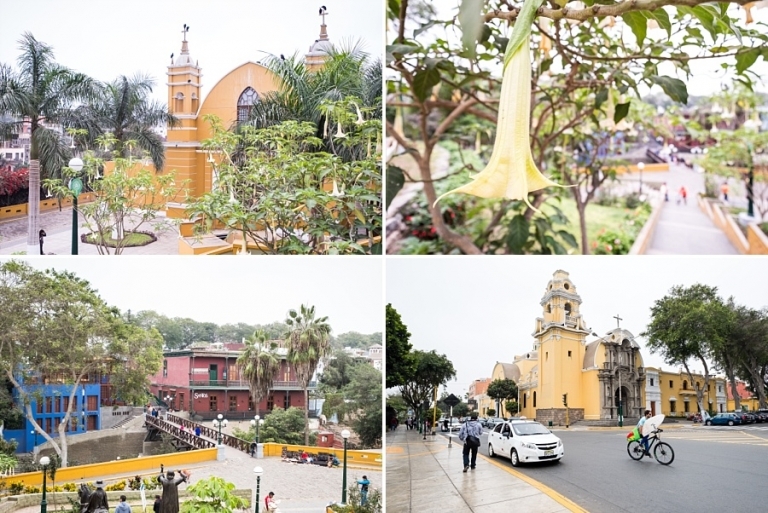 The bright white skies of Lima in winter made kind of a gloomy first impression on me, but I easily warmed up to the capital once I started tasting the cuisine. And okay, I will post the exact details on one of the locations – Huaca Pucllana Restaurant is absolutely worth a stop if you don’t have time to do the food tour. We enjoyed so many dishes including anticuchos, lomo saltado, lucuma mousse, and warm rice pudding, plus we had a beautiful view of the archaeological site while we ate our lunch. Of course, Chris and I had to try Peruvian beer, too, so after our tour we made a point to check out the Barranco Beer Company brewery in the charming bohemian neighborhood of Barranco. They offer six brews on tap and we tried all of them, as well as an empanada snack in place of a light dinner (not pictured). By the evening we found ourselves needing only something sweet, so we finished up our first day in Peru at Manolo Churros, a staple in the Miraflores district. The next day we boarded a plane for Cusco in order to start our week-long adventure in the Sacred Valley, but we returned to Lima once again after the trek…you know, so we could eat (and see) a few more things before returning to the States. Thursday evening we met up with a friend of mine from Virginia who moved to Peru a couple of years ago. We ate at a great Italian restaurant, Los Bachiche, to switch things up from Peruvian food. You might be asking, “Where are the photos, Susan? !” Alas, we were too busy chatting and catching up, so I don’t have a single photo to show you! But I can attest that my tortellini was divine. On Friday, our last full day in Peru, we wanted to visit the historic central area so I booked a walking tour, but first we stopped at the popular La Lucha Sangucheria for a chicharrón sandwich and fresh juice. The sandwich is pork, sweet potato, onions, and a green aji sauce and I’m glad we tried it! So good. We also happened to book a hotel practically next door to this gem in Lima, Miss Cupcakes. I don’t know about you, but I’m still really into the whole cupcakes trend and I love trying them wherever I can find them, so what I am about to state is a big deal: these were the best cupcakes I’ve ever had. Booking a hotel just yards away from this place was kismet. Six cupcakes lasted two people less than 24 hours. Thankfully we had already earned our cupcakes from the prior week’s hiking, biking, and climbing! For the grand finale to our Lima caloriefest, Chris and I headed to ámaZ in Miraflores for a huge Amazonian-Peruvian feast. Our eyes were bigger than our stomachs so we ordered a ton of dishes, and even the half-portions at ámaZ are generous. I’ve never been so full in my life! We tried wild boar empanadas, a charcuterie board, lomo saltado, fried rice, and pork-stuffed plantains. It was all amazing, and so satisfying. Their dessert menu looked incredible and definitely tempted us, but we found ourselves too full for another bite. This was one of our favorite meals on the trip! We consider our quest to Eat All the Things in Lima a big success! 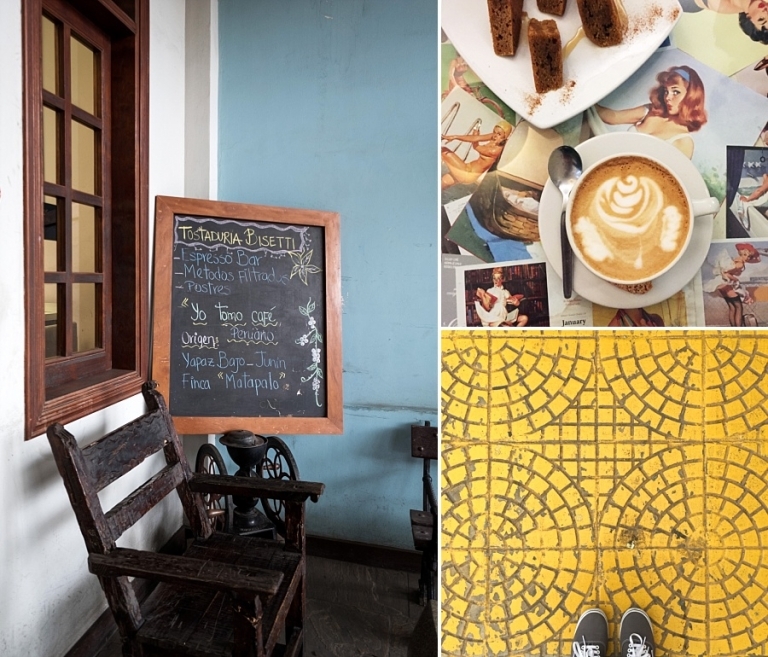 We do have a few places left over on our list because we ran out of time: Panadería El Pan De La Chola is one that I wanted to get to, but just couldn’t squeeze it in during our stay. 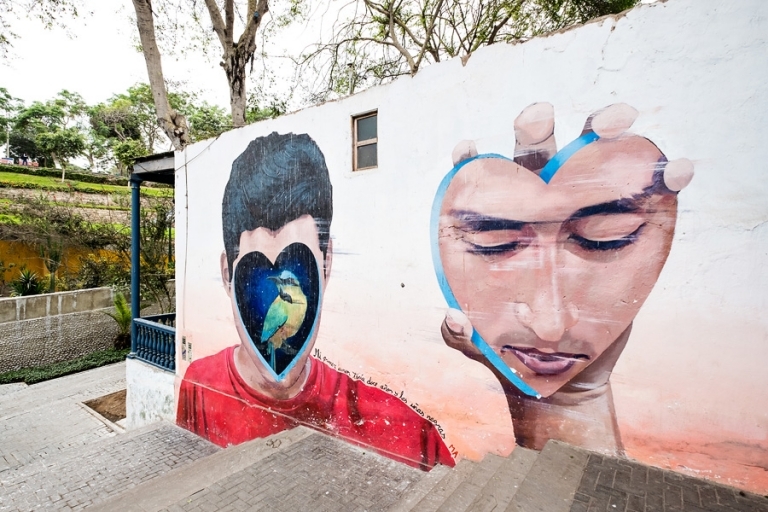 If you’ve been to Lima, how did we do? Did we miss anything that we need to put on the list for next time? Up next: we visit Cusco before jumping into our Lares Adventure! Susan - Lima was so delicious! You’d love it, and you would add tons of gorgeous images to your food photography collection!